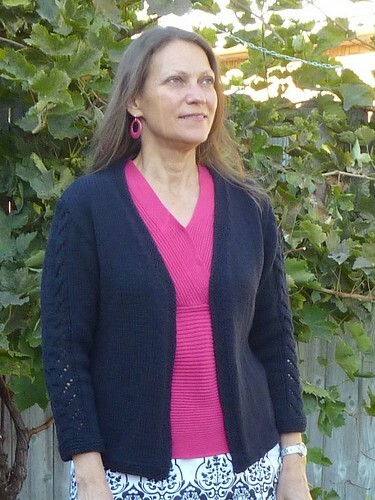 I got my mother’s cardigan finished, just in time for some lovely fall weather. I’ll take it over to her this weekend, and see how it fits. I may have to lengthen the sleeves slightly, but that shouldn’t be a problem since I knit them top-down. I left them slightly short, thinking that they would probably grow a bit after washing, but they really didn’t. However, her arms are shorter than mine, and she wasn’t really sure how long she wanted them anyway – I think she might be happy with the length. Modifications: Knit the sleeves top-down so that I could adjust the length as needed. Had to invert the lace chart and slightly modify it slightly for knitting upside down. Did not do any waist shaping. More details on my Ravelry project. I liked the yarn, which is what the pattern called for (in a different colorway), but it looks like it may have been discontinued. Too bad – it seems to be a nice wool/cotton blend. Another win for sure! Don’t you hate when they discontinue a good yarn? I’m sure she will LOVE it – it looks wonderful. I really like the sleeve lace detail too. Your mom is going to love it!!! It’s beautiful! I’m sure your Mom will love it. Pretty! Will Mom let you take a photo of her wearing it? It turned out beautifully — and will look gorgeous on your beautiful mom! It turned out great, I think. I bet she wears it every day. A lovely finished project. Your mom is a lucky woman!